It’s not quite Christmas yet, but here’s your Christmas comic. It’s a little early because I think I might be taking this Friday off. So, there will be no new comic on Friday the 26th. I despise missing updates, but this will give me a bit more time to enjoy the holidays. This entry was posted on Monday, December 22nd, 2008 at 12:00 am and is filed under Comics. You can follow any responses to this entry through the RSS 2.0 feed. Both comments and pings are currently closed. Hola Sirs. Happy holidays. I’ll be playing WoW with you guys soon. Do I need to point out more here? We’ve already had significant flash floods from all the raining I’ve done on various parades tonight. Now, if the joke is just because Ence is being silly, then I have no suggestion there. Locke doesn’t have hair that stands out more than usual. 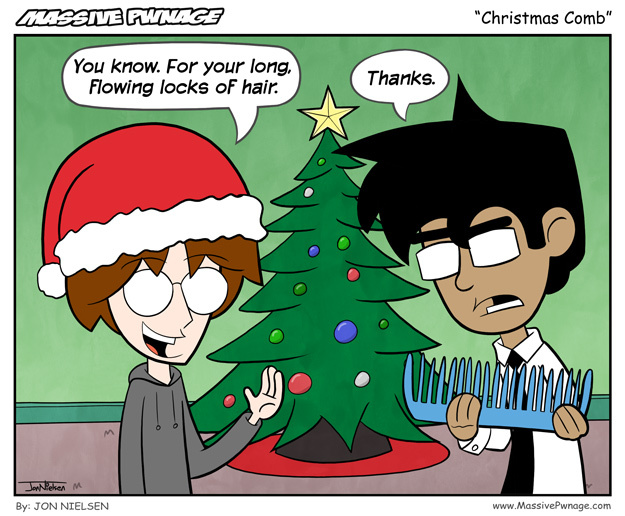 Could the joke be that Locke is so similar to Tycho from Penny Arcade, a character with a massive shock of hair, (and thus would need a giant comb)? If so, kudos on an extremely witty jab at yourself. Why don’t I believe that was the intent of the comic this time? And yes, I’d hate me too if I were in your shoes right now. Actually, there is an old Christmas story, about two dear friends who are very poor. One sells his pocket watch to buy combs for his friend, and she sells her hair to a wigmaker to buy him a pocketwatch chain. This being Christmas, I have to assume that this is a reference to that. Also, seriously, nobody else here agrees with you. Eloquence doesn’t get you very far when you don’t do your research. Also, you’re not eloquent. Yes, I was aware of that old Christmas story. I considered that might be where the heart of this comic came from. But beyond giving the comb and mentioning the locks of hair, there isn’t anything to say that it takes the inspiration from said old story. There’s just a big comb. And no watch. I don’t care if people agree with me, I’m just commenting because I can. I’m not trying to be eloquent, I’m just trying not to sound like an idiot with poor spelling, poor word choices, and poorly-worded arguemnts, and I realize that’ll be up for debate since you don’t like me. I’m challenging Ence and Locke in order to push them to excel. I don’t think the comic is terrible, I want to see it get better. “did you seriously”-I’m not plaguing this site. I have no power unless part of you agrees with me. My opinion should have no sway on you just as if I stated, “Blue is the best color.” If you like red better, who cares what I think? Actually. Ence really did just give me a friggin’ big comb. I don’t know if Ence was referencing that story in the gift, or if he was just being a goofball, but that’s pretty much a reenactment of our holiday, lol.